Auspicious number again, number 44 for my Reiko's Project 365. This is the last photo that my Nikon camera captured. 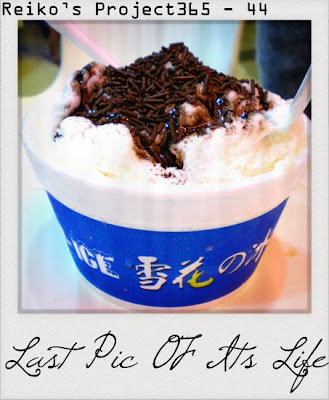 I can still remember the texture of smooth, snow flakey ice and taste of sweet sweet chocolate toppings. Hopefully can get camera as soon as possible, really feel so lifeless these few days. Everything seems so wrong. Sigh.